Of all the probiotic supplements out there right now, Probiotics One Daily Support is one of my favorites! There’s a number of reason’s why I like it so much, but the main one is I just felt better while taking it. My stomach (which sometimes gives me issues due to IBS) felt great and I had a bit more energy than usual. I also was able to digest all my meals without any problems, a major plus! Another thing I like about this probiotic is the balance it has between CFUs and number of strains. In our opinion, 6 billion cells and 6 different strains (split between the Lactobacillus and Bifidobacterium families) are a near-perfect combination for a probiotic you’re going to take everyday. That’s enough to be effective, but not overkill like many probiotics today. Next up, I like that these probiotics don’t require refrigeration, last up to 18 months and are easy to take (because they are SO small and you only need one a day). With my crazy lifestyle, that kind of convenience is extremely important! Last but not least, I like that the company stands behind their product with a simple, 60-day moneyback guarantee. So all-in-all, we gave Probiotics One Daily Support 5 out of 5 stars and think it’s a truly great probiotic! Probiotics One Daily Support has 6 billion CFUs in a proprietary blend of 6 probiotic strains (all resident strains found in the human gut — no SBOs or yeast). Of note, I like the use of Lactobacillus acidophilus, which is a naturally-occurring friendly bacterium in the body. This particular strain has been researched quite extensively in the probiotic world. It has demonstrated potential benefits such as producing lactase (the enzyme that breaks down the sugar in milk), preventing and treating diarrhea, and reducing the overgrowth of harmful pathogens in the digestive tract. Lactobacillus acidophilus has also been researched to show potential relief in symptoms from Irritable Bowel Syndrome (IBS), Crohn’s disease, and gut dysbiosis. This strain may also help with increasing your immune response, potentially treating respiratory infections and decreasing the frequency of urinary tract infections (UTIs) and vaginal yeast infections. Bifidobacterium longum has anti-inflammatory properties that help protect the cells lining your mucous membranes from harmful toxins and may also help immune cells mature in order to function properly. This strain is also able to ferment a wide range of carbohydrates including lactose and the sugars found in cruciferous vegetables such as certain cereal grains and dried beans that humans aren’t able to digest. B. longum has also been researched to show potential health benefits such as seasonal allergies, weight loss, bone health, gastrointestinal upset, and diarrhea associated with antibiotic use. Lastly, I like the use of the special prebiotic Fructooligosaccharides (FOS). Prebiotics like FOS makes probiotics more effective and acts as a food source for the probiotics to keep them alive longer. 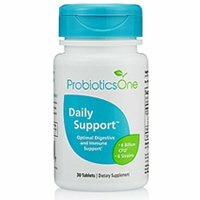 Probiotics One Daily Support really shines when it comes to allergy concerns. This probiotic is incredibly allergy-friendly (something that is very important to me and others who have allergies and intolerances). The pearl tablets contain NO: soy, yeast, lactose, eggs, wheat, nuts, sugar or iron. They’re also gluten free, NON-GMO, and 100% Vegan. The tablets are all-natural and contain NO chemicals, preservatives, artificial colors or flavors. It states that the tablets may contain trace amounts of the milk protein casein from the fermentation process, but that it’s lactose-free. For 30 pearl tablets, lasting one month, it costs $24.95. By taking 1 tablet daily as directed, it works out to be $0.83 per day. That’s slightly higher than average but considering how well this works, it’s very reasonable. Honestly, I’d rather pay a bit more for a high-quality probiotic, rather than ingest something “cheap”. I was very happy because I didn’t experience any negative side effects. In fact, my belly felt great the entire time I was taking Probiotics One Daily Support. I didn’t experience any bloating, gas, or abdominal cramps. Probiotics One offers an unconditional 100% money back guarantee. You have 60 days to try any of their products and if, for any reason you don’t like it, you can get your money back. The company really goes the extra mile to make it as painless as possible to return an item too. It says you don’t need an RMA number, no long questionnaires about every last thing you didn’t like about the product, and it doesn’t have to be unopened. I love companies that offer their customers this type of guarantee. To buy Probiotics One Daily Support, click here.